These spectacular photos were taken at Big Marine Lake in northern Washington County, MN yesterday evening. There was an enormous mayfly hatch at the end of the day. Ron Lawrenz, Director of the Lee & Rose Warner Nature Center happened to be there with his camera. He said of the event, "I stopped by the south eastern landing, off May Avenue, about sunset last night and witnessed a spectacular mayfly hatch. There were millions (honest!) of mayflies in the air and perched on the vegetation." The insects were so numerous they even landed on and covered Lawrenz as he stood there. The hatch had apparently not escaped the attention of dragonflies, birds and frogs all of whom were present as well feasting on the mayflies according to Lawrenz. Though they can and do cover everything in sight, if you do have a mayfly hatch you can be reassured by two things. First off, the adult mayflies live anywhere from 30 minutes to perhaps a day at the most. The exact length of their life depends on the species. The adults hatch out, mate and then die. They don't even have functioning mouths or digestive systems though, interestingly, the males do have two penises! I suppose that makes some sense if your sole function in your short existence is to mate. If you find them a bother don't worry, their short life means they won't be around for long. Second, you should be really proud to have mayflies on your lake. 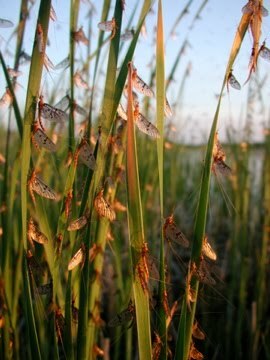 Mayflies are extremely pollution insensitive and can only survive in the cleanest of lakes. If you have a large hatch on your lake you must be doing something right.